Earlier this month, Citizens Uprooting Racism in Bermuda [CURB] announced the launch of “truth and reconciliation community conversations” beginning in February 2017. In a statement today, CURB said, “Reconciliation is the process of establishing and maintaining a mutually respectful relationship between peoples previously separated by oppression and violence. “In order for that to happen there has to be a raised awareness about that oppressive past; a process of telling one’s story of harm; acknowledgement of the pain and damage that has been inflicted; a willingness to atone for the causes; and action to repair the harm and change behavior moving forward. “To some people reconciliation is the reestablishment or restoration of a once peaceful state. With the first slaves being brought to Bermuda in 1616, three years before they were brought to North America, in this island’s context it could be argued that there never was a time when people were truly together. “The 1959 Theatre Boycott and the 1971 legislation desegregating the primary schools did not instantly result in reconciliation. For years afterwards, prejudice, discrimination and marginalization has continued [and still continues] in our community. “The call for a Bermuda Truth & Reconciliation Community Conversations is a call to action to set the people of Bermuda on a path towards greater understanding and unity, and to help society fully understand the damage done to one group and its continuing legacies, and the need to repair that damage. “Reconciliation must by definition support the Black Bermudian community as they work towards healing from the trauma of colonization, slavery, segregation and ongoing discrimination. It must inspire all Bermudians to create a society where opportunities are available to all people and to ensure that people can live with dignity, peace and comfort. “At stake is not only the well-being of Bermudian people, but Bermuda’s reputation as a prosperous, just and inclusive society. “1] A serious history of injustice within the community, where one group has been badly treated by other groups or powerful institutions. [Bermuda’s 218 years of slavery, 137 years of segregation, and subsequent ongoing economic intimidation and discrimination]. “2] When past injustices persist into the present: the bad things that happened in the past continue to burden the oppressed group in the present. [Legacy issues from Bermuda’s past continue in the present with intergenerational trauma, economic disparity, identity issues and an ongoing culture of fear and culture of silence]. “3] Continuing resentment, anger, frustration and division within the current population. The injustice of the past continues to be a source of emotional division between members of the relevant groups. [Full acknowledgement of the past and truth telling about that past has yet to happen. Ongoing discord in our community shows the divisions remain]. “4] Recognition that Bermuda’s oppressive past shares common features of violence and/or subjugation where Truth & Reconciliation processes have been invoked in other countries to date. [218 years of slavery and 137 years of segregation clearly fit this description]. 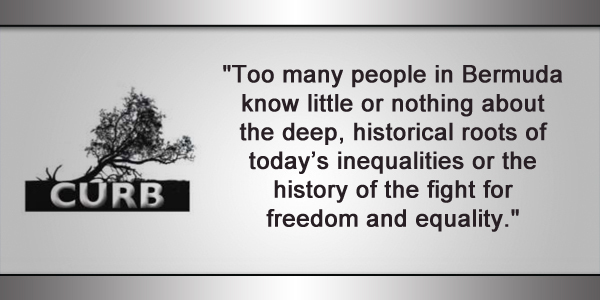 “Too many people in Bermuda know little or nothing about the deep, historical roots of today’s inequalities or the history of the fight for freedom and equality. This lack of historical knowledge is detrimental to the Black community and to the people of Bermuda as a whole. “When it comes to government it makes for poor public policy decisions. In the wider community it reinforces racist attitudes, discrimination and stereotyping. It fuels civic distrust between Black Bermudians and others. History plays a critical role in reconciliation; in order for Bermudians to build a stronger more equitable future, we must learn from the past. “There is a need to expand the public dialogue and action beyond the Truth & Reconciliation Community Conversations. It needs to become a part of every group’s mandate, from charities, organization, businesses to faith groups, sports club and the arts. “To that end a coalition of social justice organizations will be convening in early February to discuss the formation of a Bermuda Truth & Reconciliation Coalition, a loose group of organizations committed to bringing the process of truth and reconciliation into their work. “This work can take the form of events around Sites of Memory [places that hold special meaning to the Black Community]; celebrations of those that fought for the freedom and rights so hard won in Bermuda society; exhibitions/plays/reconstructions of past events; lectures/forums/presentations on parts of our history little known; actions to change legislation, policy, procedures that still create imbalances in our society. All are part of the process of raising awareness, dialogue, healing and repairing the damage. “Bermuda’s Truth & Reconciliation process will not solve our problems overnight. It will require ongoing effort, alertness, legislative changes, sustained political will and committed groups and individuals to continue the work. “We must be willing to take ongoing positive and concrete steps at all levels of society, and concerted material resources, to sustain the momentum and to create a just society for all our children to grow up in.